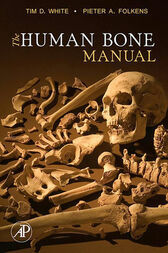 Building on the success of their previous book, White and Folkens' The Human Bone Manual is intended for use outside the laboratory and classroom, by professional forensic scientists, anthropologists and researchers. The compact volume includes all the key information needed for identification purposes, including hundreds of photographs designed to show a maximum amount of anatomical information. "Superb illustrations and lucid anatomical descriptions...in a smaller weatherpoof paperback format that will make it indispensable to anyone doing bioarchaeological fieldwork." "This book is an excellent resource for archaeologists, palaeontologists and forensic anthropologists...highly recommended." "Concise, tightly written, and rich in photographic detail—will be the standard human identification reference for generations to come." "Clear and instructive...It is, quite simply, the best human anatomy manual currently available."